Branded Cities Network has converted its renowned Harmon Corner Digital Screen in Las Vegas to Broadsign’s digital signage software platform, BroadSign X. Measuring 60’ x 310’ in size, the LED board is longer than the length of a football field and equivalent to the area of more than 27 typical highway displays. BroadSign’s software will be used to manage Harmon Corner’s out-of-home programming. The digital screen airs mostly advertising-based content that permits full or split screen messaging, name and logo rebranding, and interaction via mobile phones and social media. The screen’s campaigns are intended to generate international publicity and uplift in sales for high profile brands such as McDonald’s, Pepsi, Walgreens, Anheuser-Busch, Cirque du Soleil, Rolex and Diageo. BCN already uses BroadSign’s content management software for some of its digital signage applications consisting of LED screens located in densely populated areas, such as the Denver Theater District, Los Angeles and the Las Vegas Strip. With the latter having attracted almost 40 million visitors in 2012, according to a 2012 report from the Las Vegas Convention and Visitors Authority, Harmon Corner is situated to capture impressions from the Strip’s substantial daily vehicular and pedestrian traffic. 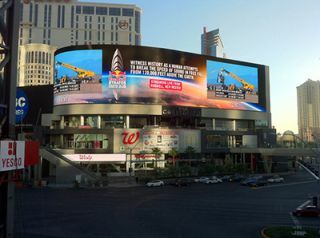 “We selected BroadSign’s platform to power Harmon Corner not only for its ability to distribute content to multiple platforms and provide precise reporting, but because their services department went above and beyond to develop a unique method of handling large format digital displays with pixel counts over 30 million,” said Elliot.